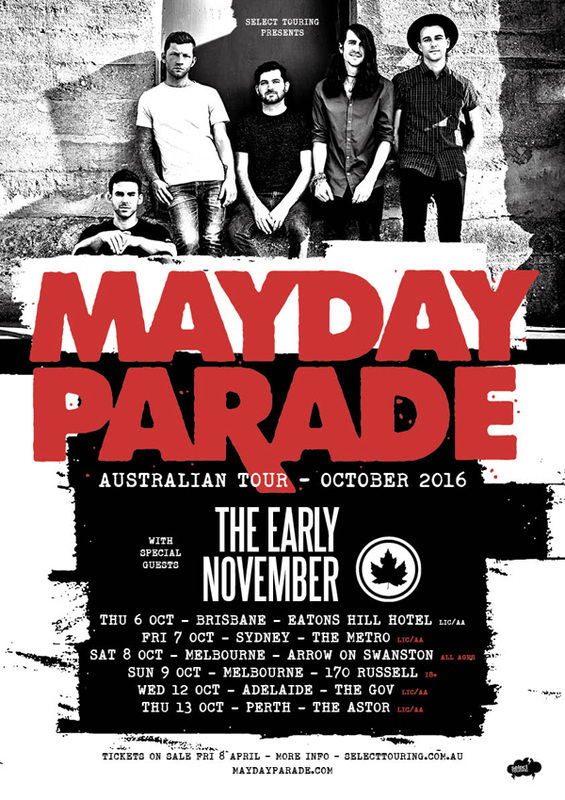 ​Pop punk phenomenon Mayday Parade are heading Down Under in October on their most extensive Australian headline tour to date to support their fifth album, Black Lines. Black Lines is a melodically diverse collection of striking tracks, blending driving rock riffs with the band's signature heartfelt lyrics, without losing what is quintessentially Mayday Parade. Vocalist Derek Sanders enthused about their new album, “It’s time to switch things up a little bit” and they definitely have! Philadelphia’s favourite sons The Early November will be joining Mayday Parade for this tour. Having won over Australian Soundwave crowds back in 2013 with their epic live performances, The Early November head down under in support of their 4th full length Imbue. Having sold out all shows on their last headline tour, don’t miss Mayday Parade this October. Armed with an electrifying live show and the same undeniable passion, these live shows are sure to be infectious and memorable as ever.